Let’s save the discussion ofgenerateComponentTrace for next time. As you can see, Vue.config.warnHandler is a function. The function takes a message , a Vue instance, and trace as parameters and allows you to customize warning handling within the body of the function. Would it surprise you to learn that hasConsole checks whether the environment has a console? console.error “outputs an error message to the web console.” Here, console.error outputs “[Vue warn]: “ and concatenates msg and trace. msg comes from the parameter passed to the warn function. trace is set within the warn function, as described in more detail above. 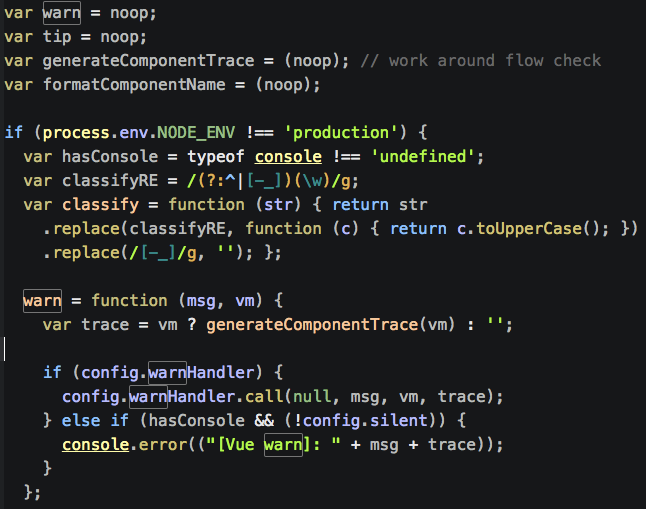 To recap, in development mode the warn function takes a string and Vue instance as parameters and then either calls a custom warning handler or a default console.error error handler to warn you of an issue. The default handler provides a warning message and trace. In the next post, we will take a look at the generateComponentTrace function.